I’ve been writing about Northern Ireland for the UK newspapers for the past 20 years, urging mainlanders to come and see for themselves, and travelling over regularly to get my fill of fabulous landscape, unspoilt coast and countryside, small town life, Seamus Heaney, mighty traditional sessions, salty people and the general magic and madness of the place. As someone who loves walking, and revels in his freedom to do so on the public footpaths and open access uplands of England, Scotland and Wales, I just couldn’t help but be struck by Ireland’s Big Problem, both north and south of the border – the almost total lack of public rights of way, and the consequent dearth of public footpaths on the Ordnance Survey maps. True, there was the Ulster Way, that unwieldy, half-dead, 500-mile snake of a path with its tottering signs and swathes of boggy morasses. 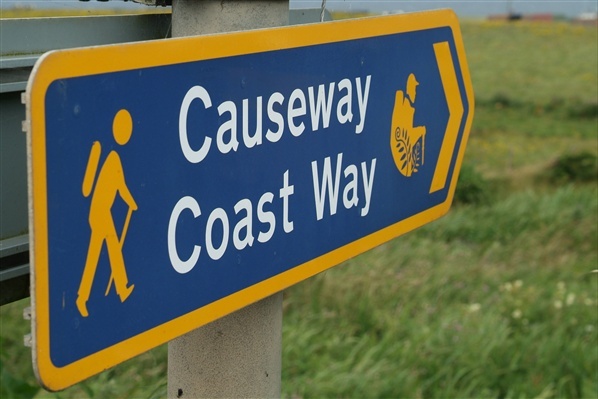 But what about the kind of country walk that people actually want to do? – the circuit of 6 or 7 miles through lovely countryside, chatting to folk you meet on the way, getting a peek into local lives and a sniff of the farming year, up hill and down dale, circling back to the pub where you left the car for a nice pint and a plate of pie and mash. Nothing doing on this side of the water for a stranger who didn’t know the locals. “Ah, sure, you’ll be grand, no-one’ll have a word to say, go ahead and welcome,’ said everyone. Two bulls, four intolerant farmers with their eight fists a-shaking, several miles of barbed wire and uncountable quagmires later, I’m here to report that ‘welcome’ was not exactly the word I’d have chosen. Until now, that is. All one can say about the Quality Walks developed by CAAN and partners is – about bloody time, and thank you very much! How brilliant it is to be able to find a walk of the right length and in the right place, download those maps and instructions at the stab of a keyboard, and go to the spot to find that, yes, it really is there, properly waymarked, well maintained, and laid out as the map says. I’ve done quite a few now. In Fermanagh the circuits around Castle Archdale on Lower Lough Erne and the fantastic country house of Florence Court; in Armagh the legend-laden walk across Slieve Gullion and a saunter through the wildflower meadows around Oxford Island; in Tyrone’s Sperrin Hills the haunting loop round the abandoned farming valleys of Vinegar Hill. In County Down the Mourne Mountains, of course, up the Hare’s Gap, and along the skirts of the mountains in Tollymore Park; but also a great walk round the eccentrically wonderful gardens of Mount Stewart and a mud slide out across Strangford Lough to Chapel Island. In Belfast, three contrasting walks – the Bog Meadows, the Lagan towpath and Cave Hill. 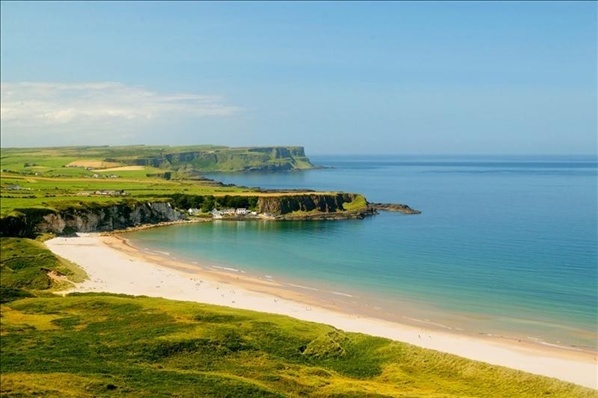 In Antrim: Ballycastle to Ballintoy along the spectacular Causeway Coast, the crashing waterfalls and forest paths in Glenariff, and two great mountains – the tiny bump of Croaghan and the great big lump of Slemish. And in Derry, so often overlooked by walkers, the long and beautiful strand at Benone, the tanglewood of Drumlamph and the thundering falls in Ness Wood, and the incredible views from the peak of Carntogher. My favourite? Oh, lordy. OK, if I have to choose, let it be that mindblowing sunset on Strangford Lough smearing the low-tide mud with crimson and gold, the babble of brent geese on the tideline, and the Mournes outlined in furious crimson as if a sky god had thrown open a furnace door behind them. Christopher Somerville has spent 25 years writing and broadcasting about country walks (and tougher hikes), life in remote rural and island communities from Scotland to Crete by way of the Faroes, music-making in Irish pubs, festivals from Spain to Sweden, and the pleasure and delight of telling stories and weaving yarns. Christopher's latest book, Walking in Ireland, brings together a comprehensive guide to the fifty most stunning walks in northern and southern Ireland - visit www.christophersomerville.co.uk for more information.